I confess I did not see all the Oscar nominated films this year. But I did see "Sunshine," and so glad I did. This is one of the first films I've seen in a long time that brought together comedy and tragedy with just enough hint of satire and farce to make us re evaluate what's important in life with a fresh take. 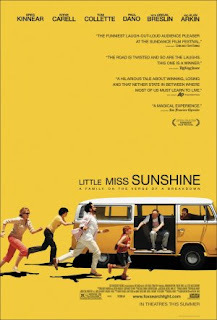 In this movie, we witness the Hoover family as they let it all hang out on a family trip from New Mexico to Redondo Beach to the Little Miss Sunshine competition, where youngest family member Olive is competing. Never has the expression "life is a journey" reverberated so much, as this family trip becomes a metaphor for that little push we all need sometimes to keep us together. Without being corny or sentimental, the movie shows us how the goal itself becomes less and less important as the journey itself to Redondo Beach, punctuated by various ephiphanies on the part of each family member. The trip serves as a microcosm of life, as each family member arrives at some inevitable truth about themselves that enables them to go forward - including, for the grandfather, Allan Arkin, the inevitable truth of death. Abigail Breslin plays a convincing 7-year old with delusions of grandeur, headed for the Miss Sunshine contest. Greg Kinnear is motivational speaker Dad, whose motto is play to win despite heading for a breakdown himself. Toni Collette plays a supermom trying to keep everyone on track with Kentucky Fried Chicken dinners. Steve Carell is mom's brother, a suicidal academic who's been borderline ever since he was dumped by his boyfriend; and Paul Dano, the alienated teenage son whose campaign against speaking and whose need to write everything down in the first half of the movie, is a fitting analogy to scriptwriter Michael Arndt's message. In the end, the characters may not all find what they want, but they discover each other, and keep the broken and imperfect VW van of life moving. Kudos to writer Michael Arndt for writing characters the way they really talk, and for showing us what real winning is. I'm sure this won't be the last we see of him.